It’s the season for bunnies here at the Crossroads and they are multiplying rapidly! I’ve been a little slow about getting our mantel decorated, mainly because it’s been so darn cold here in South Carolina. But it’s finished now, and it’s all about the bunnies! I’m featuring this pencil drawing created by my art instructor, Danny Stegall. My sister-in-law and I have been taking drawing lessons since January, and we take turns selecting what we’d like to draw each week. Danny draws along with us and then gives one of us his original drawings at the end of the class. I got the bunny! Isn’t he just beautiful? I have so much to learn about shading and he is a master at it, as you can see. Now most people would frame this, and I eventually will. 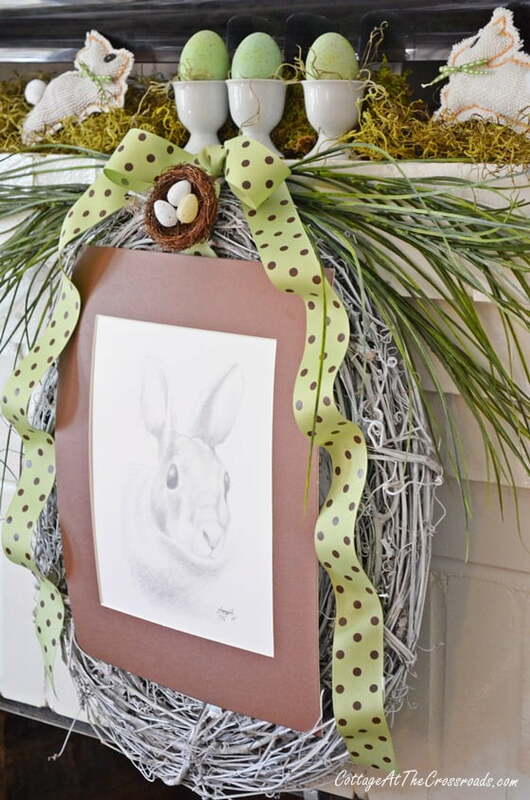 But since it’s bunny time, I matted it and put it on this grapevine wreath that I had previously spray painted white. I decided to use a green and brown theme for the mantel since those are some of the colors in our living area, and I found the ribbon at Hobby Lobby. I tucked some green eggs down into the egg cups and covered the top of the mantel with some green Spanish moss. It does a really good job at camouflaging some speakers that sit on the mantel. 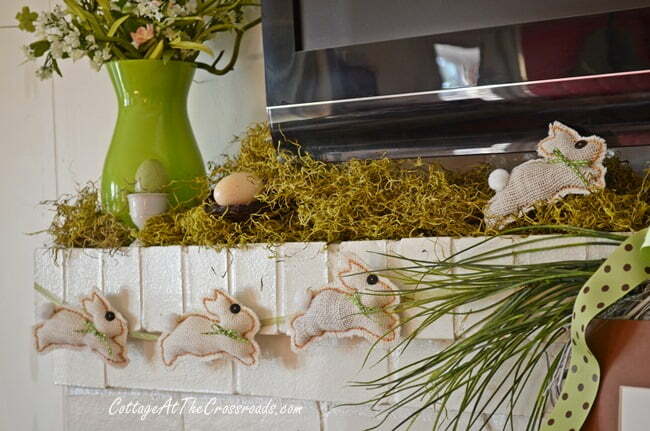 My White Burlap Bunnies that I made a few weeks ago are hopping along the mantel. 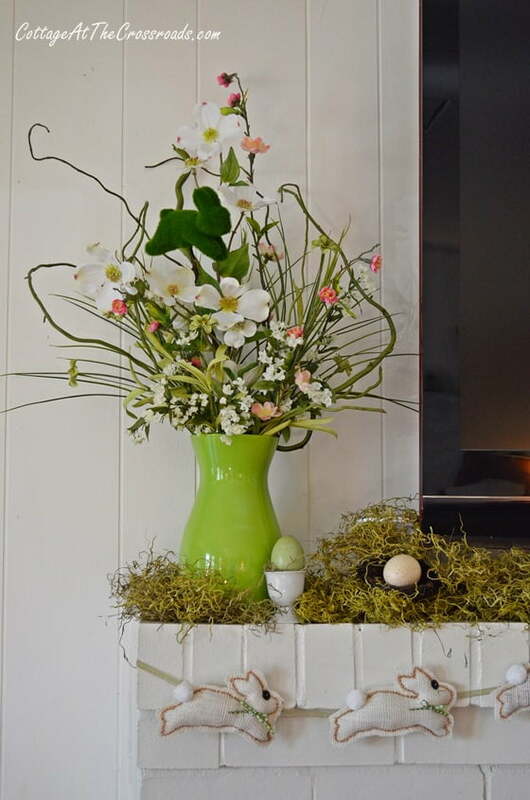 The spring arrangement on the left was made with faux spring flowers with a little green spray painted curly willow. A green moss bunny is peeking out behind the dogwood blossoms. 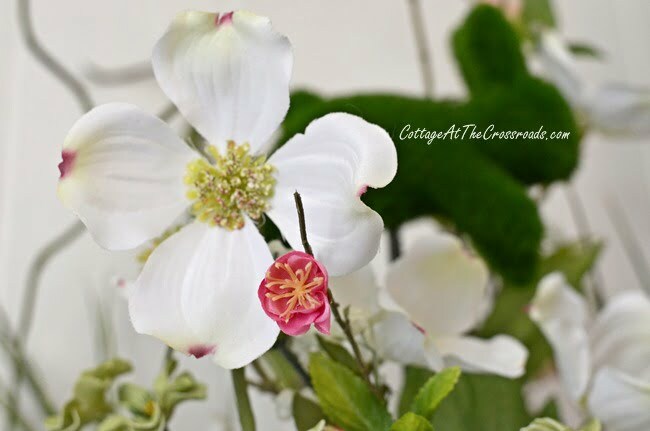 We have several dogwood trees in the yard, but they aren’t blooming yet. On the right side is another moss bunny, but this guy is a large one. He looks like he’s watching all the other frolicking bunnies, doesn’t he? 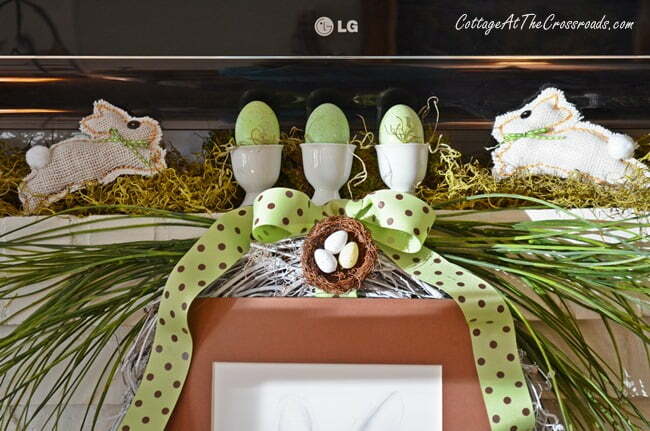 I added a few more nests and eggs to the mantel because, after all, you cannot have a spring mantel without nests, can you? It was so much fun decorating the mantel around Danny’s awesome drawing! Here’s wishing you warm weather, bright sunshine, and a happy spring! 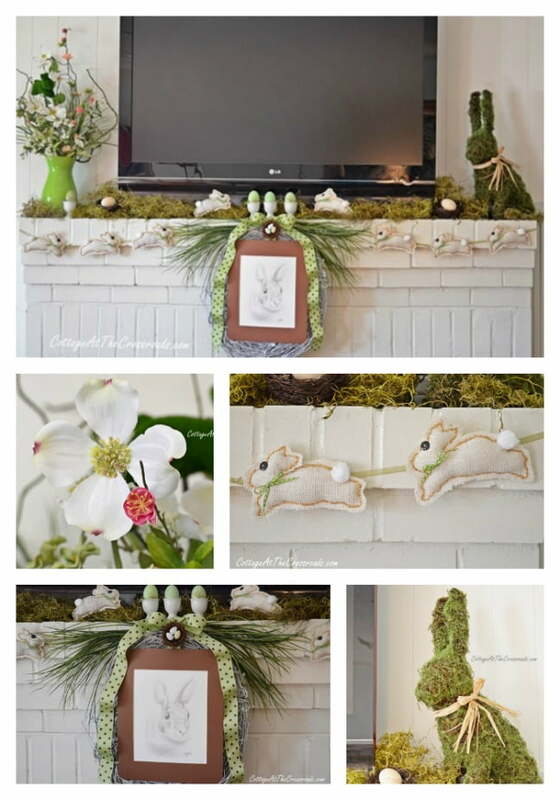 What a beautiful Spring Mantel you have created! I really enjoyed your creation. Looks like you are becoming a wonderful artist too! 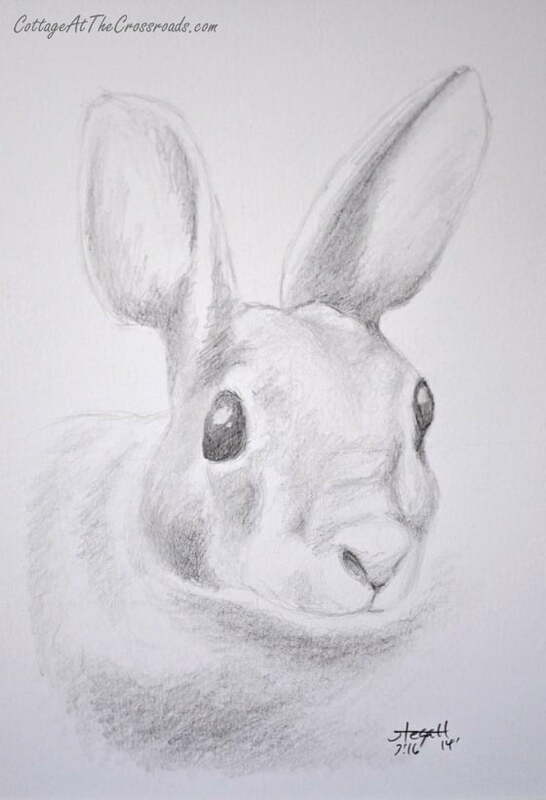 What a treasured keepsake; lucky you receiving the original bunny sketch! So cute Jane! I love all the moss and the bunny too! I love your mantel! The bunny drawing is wonderful! Lucky you taking lessons!! Jane this is so GORGEOUS I don’t even nowhere to begin. I truly love every thing!!! PINNING!!! 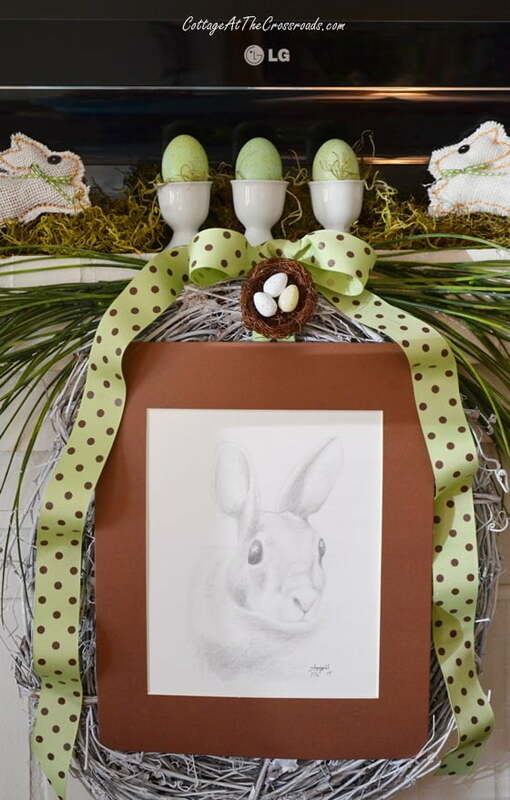 I am not a bunny person, But I have to say that your mantel is beautiful. Adorable. Love the drawing. You are so talented. So beautiful and spring like. I love the pencil drawing. I wish I were taking lessons, too. 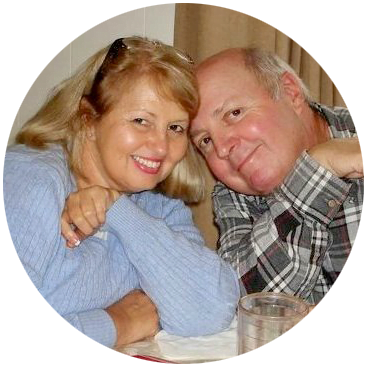 I can’t wait to see some Jane Windham Originals. Your mantle looks lovely with the fresh greens and whites. 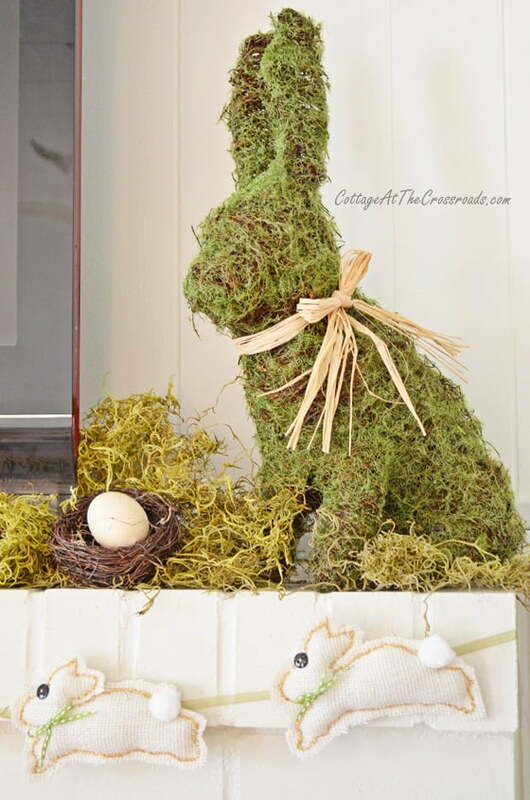 The green vase adds perfect balance to the moss bunny. Your design looks so well balanced. I love symmetry when decorating a mantle. I am working on my mantle. It’s a slow go. I have a very homely fireplace so it is hard to get inspired. 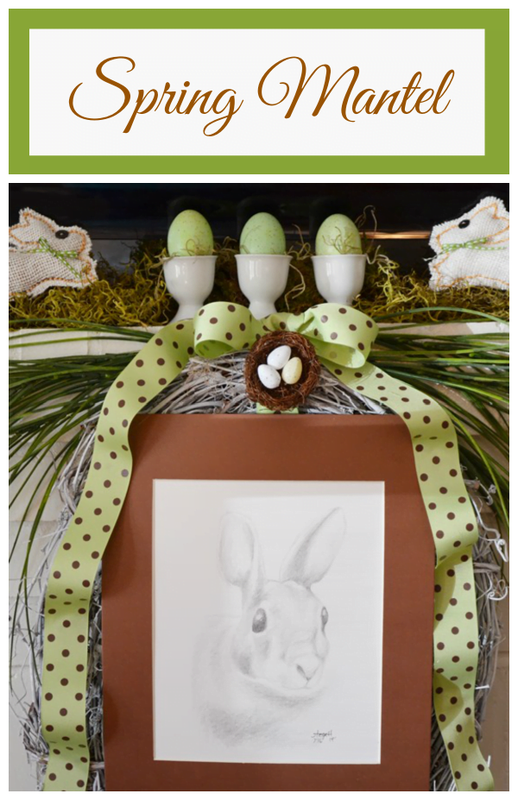 Your Spring mantel is just so pretty Jane and that drawing is so amazing! It’s beautiful, Jane! It screams Spring & I think we can all use a little of that right now. I think you showcased that amazing drawing perfectly! Completely sweet. This bunny lover adores it!! Jane, how beautiful I had no idea you were taking drawing lessons. You go girl. Your mantel is stunning and I love the shade of green you are using. I have had the same problem with getting started, Jane. My decorations are about 1/3 there. Your mantel is very whimsical and pretty! Hi Jane! Your mantel is just darling! So many little cuties.